Chicago—ALA Publishing eLearning Solutions announces a new iteration of our popular eCourse, Genealogical Research for Librarians. June Power will serve as the instructor for a 4-week facilitated eCourse starting on Monday, Feb. 4, 2019. Genealogy is a hot topic in libraries around the world. While people have always been interested in exploring their ancestors and family origins, the rise of sites like ancestry.com and the digitization of historical documents have put libraries of all types right in the center of many peoples' search for their roots. 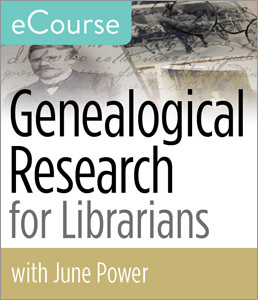 In this eCourse, librarian and genealogy expert June L. Power prepares you with the expertise you need to serve the genealogically-oriented patrons in your community. You'll start with the basics and gain an understanding of how to use both free and proprietary resources, how to use public records, and how to serve communities of diverse national and ethnic backgrounds. Each week will consist of a short video and PowerPoint, readings, and an assignment/discussion board forum that allow students to practice incorporating each week’s theme into their genealogical research. June Power is the Access Services Reference Librarian for The University of North Carolina at Pembroke, managing circulation, course reserves, document delivery services, and copyright management. She is the managing department head and has also assisted with archival and special collections work, and genealogy. She has presented at NCLA, the ILLiad Conference, the Ares Virtual Conference, the Azaela Coast Library Association Conference, and the Access Services Conference. She is on the editorial board for the Journal of Access Services and has published a series of articles in that journal as well as several book chapters. Registration for this ALA Publishing eLearning Solutions facilitated eCourse, which begins on Feb. 4, 2019, can be purchased at the ALA Store. Participants in this course will need regular access to a computer with an internet connection for online message board participation, viewing online video, listening to streaming audio (MP3 files), and downloading and viewing PDF and PowerPoint files.